Ideal for private users with small plots and gardens requiring periodic maintenance. 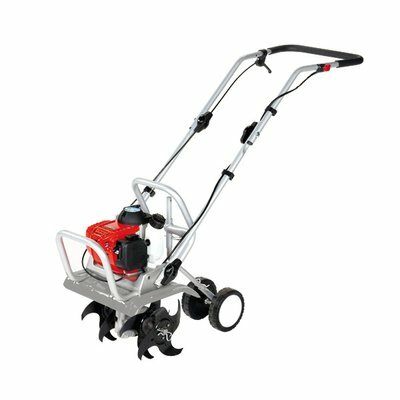 Also designed for a variety of jobs such as preparing soil for grass seeding, digging furrows for planting flowers, shrubs and vegetables, and other operations such as turf scarification and edge tidying. Its versatility means that it can also be used in combination with roller brushes for cleaning patios. Supplied as standard with a set of 4 blades giving an operating width of 30 cm. The rotors are independent to enable operation with only 2 blades, thereby reducing the operating width to 15 cm and permitting work between narrowly spaced rows of plants (such as potato plants, vegetable plants etc.). Quiet running, eco-friendly 4-stroke Honda engine, ideal for use in built-up residential areas. Extremely low fuel consumption for minimal operating costs (approx. 1.5 hours continuous operation on a full tank). 360° tiltable engine: works efficiently in any position. Simple blades which are easy to attach without tools and which fit onto the shaft for straightforward adjustment of the operating width. Integrated on/off control situated on the handgrip along with the accelerator lever, for maximum accessibility and convenience. Generously proportioned handlebars which guarantee a secure and comfortable grip during use. Available with different accessory sets for alternating soil preparation with complementary activities such as lawn tending and tidying open spaces: set of 4 additional rotors for tilling soft or previously turned soil; tool for deeper soil furrowing and preparation prior to tillage; brush with rollers for keeping porches, patios and steps free from dust, green waste and small debris; scarifier for freeing turf of moss and thatch, thereby allowing the lawn to breathe. Foldable handlebars for convenient storage and transport (e.g. in the boot of a car). The front engine guard enables the machine to be rested upright in the garage or tool shed, saving considerable space. The front and rear engine guards come in handy when carrying the machine. Transport wheel, ideal for transferring the machine between workplaces; can be raised when the machine is in operation and engaging the soil. Spur gear and worm gear drive protected by robust aluminium housing for maximum resistance to impact (stones, low walls, fences) and operating stresses. The aluminium housing provides straightforward access for quick, trouble-free maintenance and cleaning. Protective roll bar which shields the engine in the event of accidental impact or droppage.